Donnafugata is an emblematic route on enormous Dolomites tower Torre Trieste in Civetta massif. It was first ascended in 2004 by Dolomites veteran Christoph Hainz and Swiss Roger Schali. 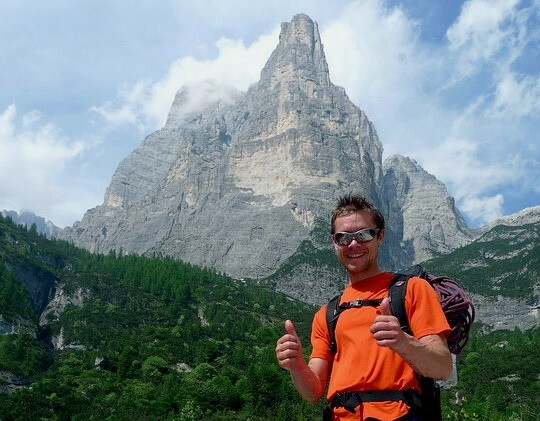 The first and the only free ascent of the route was done by Mauro Bubu Bole - after several days of study at the end of summer 2007. About Donnafugata, by Andrej Grmovsek: »To be honest Donnafugata wasn't really my goal. I wasn’t motivated to climb a hard route in the Dolomites, especially at the start of the season. I didn' want to study pitches and moves only to have to return for a free ascent, to fight the psychological stress of a free ascent. But in the end the enthusiasm and determination of my young climbing partner Luka Krajnc won me over. We went to the Torre Trieste last Saturday. Since Mauro Bubu Bole and also Erik Svab (who attempted the route last year) told us that the hardest pitch is very technical, we went there more to attempt the route then to climb it. We climbed on-sight to the key 15th pitch. But than I spent more than 2 hours figuring out all the moves on that really technical and long pitch. Then Luka spent even more time studying the pitch. I was sure I wouldn't be able to link all the moves on my second try, but I tried nevertheless and managed to send it! I was super happy, but now we were confronted with another problem. It was already 5.30 p.m. and 9 more pitches separated us from the top. The crux pitch was too hard for Luka that day and I then continued leading as fast as possible. But I fell on the 17th pitch (7b) and climbed it free with my last energy on my third attempt. It was 9 p.m. There was another 7a/a+ pitch just before the top – a total slab without holds, which I managed on my second try, with headlamp. We reached the top at 11 p.m!